Academy Marble and Granite located in Bethel, Fairfield County, CT, and Rye Westchester COunty NY.imports, fabricates and installs natural stone. We specialize in granite kitchen countertops as well as marble bathroom vanities and fireplace surrounds. 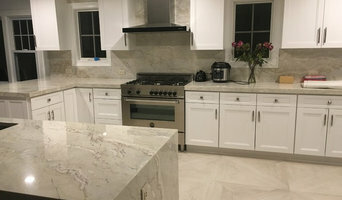 We feature one of the largest inventories of natural stone slabs and tiles in the Fairfield County, Connecticut area. Our purchasing agent personally selects the natural stone slabs from around the world. We encourage you to visit our showroom and personally select the material for your project. Our crews provide the highest quality and service. Tile America provides homeowners that appreciate quality and distinction with an exceptional buying experience – every time. Our customers return to our breathtaking showrooms for design inspiration and product selection, relying on our specialized team for extraordinary service and the type of product expertise that can only come from those who exclusively focus on tile and stone. Ontra Stone produces the finest custom quality natural and engineered stone kitchen counter tops, fireplaces, baths, vanities, and special project work in this part of the country. We are a Natural Stone Institute (formerly Marble Institute of America) Accredited Fabricator as of 2016, one of only five fabricators in Connecticut and about 100 in the nation to achieve accreditation though the most prominent guiding body in our industry. As a member of the Natural Stone Institute who set the standards in our industry, Buddy Ontra is known nationally for his passion for stone. Buddy was elected by his peers to the NSI (MIA) Board of Directors for a five-year term beginning in November of 2015. As a board member, he represents all facets of our industry from fabricators to installers to designers and architects for every state in New England, from Connecticut to Maine. The kind words and shared finished products of our homeowners have kept us in business for a decade and continue to fuel our desire to push the limits of design and the boundaries of our craftsmanship. The marble and granite craftsmen at Ontra Stone Concepts are widely known as the finest in the industry. Having moved from Monroe to Bridgeport in 2012, our fabricating and installing crews have been working together as a well-oiled machine for close to a decade and have the experience of working with all types of natural and engineered materials, from granite, marble and quartzite to quartz, sintered slabs like Neolith and Lapitec, and glass. Referrals are gratefully provided from designers, builders and homeowners who have often worked with us for years and multiple projects of varying scales. Venezia Marble is a fabricator and installer of natural and engineered stone products for both commercial and residential projects. Since 2001 we have been proudly serving the Connecticut, New York and Massachusetts areas and have successfully completed jobs in all the following towns and more! From selection to installation, our process is done to meet or exceed the industry standards and best serve you. Building on the principles of high quality work, integrity, respect, and outstanding customer service, we guarantee our customers quality results at reasonable prices. Please come in to Showroom in Ridgefield or call to get your project started. We will be happy to work with you!!! Tile Maniac Inc is an all-encompassing tile company that handles full kitchen and bathroom renovations with full knowledge in stone and ceramic floorings and much more. This page is a chance for anyone interested in us to explore why we are such a good choice and what makes us different from the rest of the companies in NY. Why Trust Us? A versatile specialist – we have been in the business of installing ceramic and stone floor tiles, designing layouts and creating unique bathrooms and kitchens for over 25 years. Enhancing the look of your home is our top priority. The long years of practice have taught us how to realize our client’s vision in the best way possible. We are an enthusiastic ONE-STOP SHOP for kitchen cabinets and countertops serving the Tri-State area with the best available products. With extended variety of options and compatible pricing both for cabinets and countertops, we aim to to ease your day and assist you the best way possible. Whether you are building up from scratch or renovating, we can offer you the best cabinet brands available to work with every budget with free measurement and design services. Carrying more than 250 different slab colors on hand at our 20,000 sqf. indoors slab-yard, we offer you endless options for kitchen countertops, vanity tops, fireplace, tub surrounds, table tops and many more with a very rapid turnaround time for installation. We import our marble, granite and quartzite slabs ourselves in blocks to have repetitive patterns, so that you don't need to worry about the slab count for your project. We give great importance to customer satisfaction and if you are looking for an experienced, professional team with the highest concernment for your project, you will be in the best hands and access a fast, reliable and affordable service. With more than 15 years of experience, this locally owned and operated company has the expertise to meet all of your building and remodeling needs. We have the most talented staff and sophisticated software to help you visualize your design and achieve the results you want for all your residential and commercial projects. To provide our customers with the latest trends and styles in the flooring industry, we are constantly searching for different sources and updating our product inventory. Stop by today and check out our large selection and great prices. M Teixeira Soapstone is a nationwide importer and distributor of one of the largest collections of soapstone available in the United States. Our natural soapstone is sourced both domestically from Virginia and internationally from quarries in Brazil and India. Because we are an importer, when you purchase from us, the “middle man” is eliminated. You get superior quality product at a lower cost. We offer soapstone countertops, sinks, tiles, fireplaces, masonry heaters & more. Visit our website to order samples of our current collection of stones and get a quick quote.